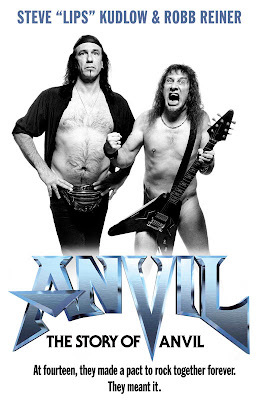 So, the story goes that at one point in the 1980s, Anvil were poised to be one of the biggest bands in the world, with their second album 'Metal On Metal' (one of many ''too metal to be true'' albums in their back catalogue) being acknowledged as a classic and hugely influential by their peers including Lars Ulrich, Slash, Lemmy and a couple of other talking heads that appear at the start of the film. For whatever reason, success eluded them and, twenty years later, Lips delivers food for schools around Scarsborough, Ontario, and Robb can often be found drilling things. A new tour and the chance to record a new album take the band back out on the road, which results in missed trains, clubs failing to pay them and shows being played to clubs which have, at most, five patrons. There is something of Spinal Tap to all of this, not least of all the ridiculous lyrics, preposterous album covers and the frequency with which hilarious phrases are uttered by the band (Robb Reiner: (On why the band weren't successful) It's one word. No, two words. Three words. We had bad management) that they seem like they could only have been written. It is all real, though, which only serves to make them more ridiculous and funny, but also makes them into incredibly tragic figures. There's a strange moment in the film when the two primary members of the group, singer-guitarist Steve ''Lips'' Kudlow and drummer Robb Reiner, have an argument during the recording of the group's thirteenth album, This Is Thirteen. After their argument, Lips goes to see Robb and breaks down crying whilst trying to apologise to him, telling him that he loves him and that he is all he's got. It's a touching moment in which you see the strength of a friendship and creative partnership that has lasted over three decades. It's odd, though, since it's in the middle of a film which seems to be, for all intents and purposes, a comedy, and up to that point I hadn't realised that I cared so much about them. It's hilarious and heartbreaking in almost equal measure. By initially having you laugh at them, you gradually laugh with Lips and Robb and sympathise with these men who have held onto their dream, probably for too long, and still want to play in front of thousands of dreaming fans. Director Sacha Gervasi is an avowed fan of the group, as evidenced by a picture at the end showing a young Gervasi posing with Lips back in the mid-80s, and he manages get across what made them special to him and makes you care for them as well.